The Paleo diet is based around cutting out potatoes, dairy products, legumes, wheat, refined sugars, grains, refined salt as well as processed oils. This leaves you with fish, organic meats, fruit, fungi, eggs, roots, nuts and vegetables. Those were the staple foods available during the paleolithic era which lasted for around 2.5 million years, but started to die out 10,000 years ago with the development of agriculture and our modern grain based diets. This was the natural diet of hunter-gatherers through the ages and while some nutrition experts have questioned the wisdom of such a diet, just as many have supported the theory that it is in fact our ‘natural’ diet and as a consequence is the best source of nutrition for the human body. As with any diet, the key is to be able to find great food that is quick and easy to prepare, tasty and nutritious. Recent studies of historic diets have indicated them to be more beneficial than typical mediterranean diets, many diabetic diets as well of course as modern western diets with regard to losing weight, heart disease and type two diabetes. Often the difficulty with incorporating a diet plan into your daily routine is the time and effort needed to prepare special foods, source specific ingredients, and cook to a required eating schedule. The potential beauty of a hunter gather Paleo diet is that most of the ingredients are available on the high street or from popular supermarkets and the preparation and cooking times are comparable with regular meal preparation. Many people resort to unhealthy diets due to time constraints and hence end up consuming low quality pre packaged food because it is quick and easy. The caveman cookbook (paleo diet) is the simplest way to eat healthily, restore your vitality and plan your healthy meals quickly and easily. 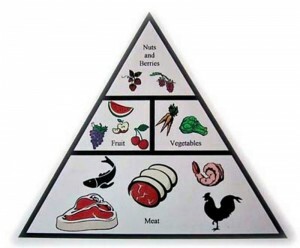 The Paleolithic diet is high in animal protein and fat and low in carbohydrates. It should be considered more of a lifestyle than a diet ‘as such’. You can eat as many saturated fats such as butter and clarified butter as you like. As long as they are sourced from organic well kept animals, duck fat, lard and beef tallow are also good. Olive oils, macadamia oil and avacado are also good fats for drizzling over foods or for salads, but don’t use them for cooking. You can eat generous amounts of animal protein including liver, kidney and heart as well as red meats, pork, poultry and eggs. You should eat vegetables either cooked or raw, including sweet potatoes and yams which are low in non-toxic carbohydrates. You should eat an amount of nuts and fruit. Aim for low sugar fruits such as berries, and nuts that contain omega-3 but little omega-6 such as macadamia nuts. You should choose organic pasture fed meat where possible, or leaner cuts on meat if not, which you can then supplement with butter or coconut oil for your fat intake. Wheat, barley, oats, corn and brown rice. Soy, peanuts, beans and peas. Margarines, corn oil, peanut oil, sunflower oil, soybean oil and canola oil. Olive oil and Avocado oil are fine on foods but not for cooking with. You should eliminate sugar from your diet. All soft drinks, packaged products and fruit juices. You should not eat dairy except for butter and heavy cream. Despite the passing of the ages, our genetics haven’t altered very much in tens of thousands of years, in fact since we were cavemen, hunting and gathering our food on a daily basis. Each day, people would eat what they found or caught, so meals tended to consist of one or two items, that they had found that day. Or stomachs make different enzymes to break down the different foods that we eat, so if you eat protein you stomach makes one enzyme to digest it, and if you eat carbohydrates for example, it makes another to break that down. 10,000 years ago our stomachs only had to digest one food at a time mostly, and functioned very well as a result. Modern diets are packed with ngredients that we are not designed to digest efficiently and especially not in the combinations that we eat them. Our bodies end up creating many different enzymes in order to try to digest the pre-packaged junk we have eaten and we wonder why we don’t feel very well! The Paleolithic Diet is derived from the Paleolithic era when we were hunter-gatherers, eating only what we could find and none of it processed, preserved or modified in any way. If you wouldn’t have been able to find it 10,000 years ago, you shouldn’t be eating it today. Modern farming methods, developed to feed an ever growing population have led to our foods becoming more and more unnatural to us. Today in the supermarket you should only go to the fresh produce, the fresh meat and the fish counter……. if it comes in a box you need to leave it alone! Aren’t Fats Bad for Me? In short, only the processed junk fats that we are all used to eating in our modern diets. Read this article for more information.